Punch’d Natural Energy Caffeine Gummies are an all natural product made from green coffee beans and they fit into any lifestyle. Took the Punch'd Challenge and it worked! I can almost see an ab now after I cut out my energy drinks and my diet cokes. Punch'd recommended I try them with more water everyday and I can say that it does really work. I haven't really changed much else in my diet but I've lost 8lbs in about a week and a half. I didn't believe it at first, but I can see it is true about all the stuff they say about those sugary and crazy weird drinks. I'm going to keep going and see what I can do by summer. Customer for life! Love Punch’d Energy! I keep it at my desk for a great little boost mid day and love using them before a work! They taste delicious! Love Punch’d Energy! I keep it at my desk for a great little boost mid day and love using them before a work! Totally recommend this product! Gummy vitamins are my lifehack. I fell in love with the EMERGEN-C energy caffeine gummies. I thought I would give these a try. They were quite a bit more bitter. I didn't find them as effective or tasty or as cost effective. They weren't horrible at all. There are just better options. It was ok Gummy vitamins are my lifehack. I fell in love with the EMERGEN-C energy caffeine gummies. I thought I would give these a try. They were quite a bit more bitter. I didn't find them as effective or tasty or as cost effective. They weren't horrible at all. There are just better options. Tastes good and does what is advertised. It works! Tastes good and does what is advertised. Love these little gummies!! I'm not a coffee drinker so these work perfect. Enough for a pick me up without all the jitters. Would also like to add that customer service is awesome. Shipping is quick. I was taking a trip and was out. So I didn't have enough for my trip. They RUSH shipped them to me so I could take them on the trip... WHAT COMPANY WOULD DO THAT!! Love the small packages to where I can pack in my purse, or suitcase if traveling. I will be a repeat customer!! Put me on Auto Ship!! I'm so happy I found these on Amazon. Great for people sensitive to caffeine! 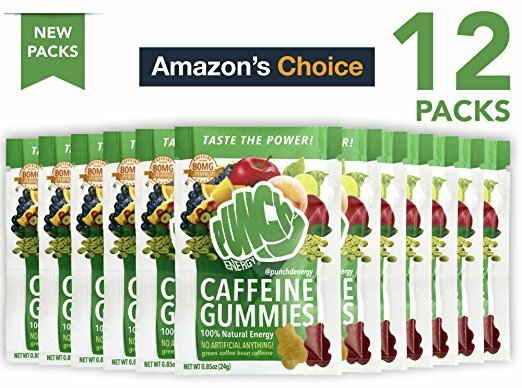 I’m very sensitive to caffeine but for some reason these gummies give me the right about energy that I need with out feeling the jitters which normally I feel if I have coffee. That’s why I don’t drink coffee and eat these gummies. Love this product. Great for people sensitive to caffeine! I’m very sensitive to caffeine but for some reason these gummies give me the right about energy that I need with out feeling the jitters which normally I feel if I have coffee. That’s why I don’t drink coffee and eat these gummies. Love this product. I love coffee, but who says I can't have both?! It's fun to switch it up with this tasty pick-me-up! I look forward to getting my PUNCHD boxes in the mail. These gummies are convenient for my on-the-go lifestyle. If you're still wondering if you should give them a try, I say DO IT! I love coffee, but who says I can't have both?! It's fun to switch it up with this tasty pick-me-up! I look forward to getting my PUNCHD boxes in the mail. These gummies are convenient for my on-the-go lifestyle. If you're still wondering if you should give them a try, I say DO IT!